Troy-Bilt's 41BDT57C766 29cc 17 in. 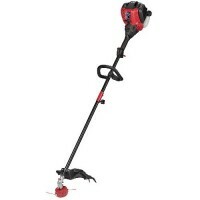 Straight Shaft String Trimmer with SpringAssist is easy to start and easy to use. Equipped with a dual line bump head and a SpeedSpool bump head to allow quick and easy loading of the line! No gas and oil mixing, this trimmer is easy to use and is designed to accept optional trimmer attachments.